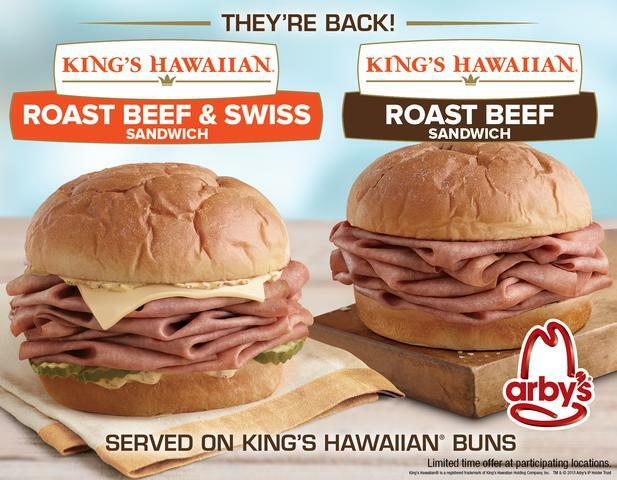 Shakin & Bakin Foodie Blog: Arby's KING'S HAWAIIAN Sandwiches are Back!!! Arby's KING'S HAWAIIAN Sandwiches are Back!!! This is a Sponsored post written by me on behalf of Arby’s. All opinions are 100% mine. How many of you love going to grab something to eat at Arby's? How many of you have tried the Arby's KING'S HAWAIIAN Sandwiches before? If you have never tried them, you are really missing out! There are 2 different varieties and they are BACK for a limited time! The Arby's KING'S HAWAIIAN Roast Beef Sandwich comes with an extra helping of freshly sliced, juicy roast beef that is piled high on a KING'S HAWAIIAN Bun. The Arby's KING'S HAWAIIAN Roast Beef & Swiss Sandwich is for those who want just a little more to tantalize their taste buds! This one comes stacked with freshly sliced, juicy roast beef that is piled high, topped with delicious Swiss cheese, crunchy pickles and a creamy Dijon spread. Yummy! Right now BOTH are back for a limited time at participating locations. You can Find an Arby's local to you by visiting their site and typing in your zip code. We have one that is about 2 miles from our home and I am looking forward to going out later this weekend and grabbing a few of them for my family to enjoy. Earlier this year we picked up a few when we were traveling and on vacation and have been patiently waiting for their return. I like the regular one but hubby goes for the KING'S HAWAIIAN Roast Beef & Swiss Sandwich. It's too much of a sandwich for me but he loves it! I like the regular one and then I add some ketchup to it and I am ready to roll! Want to learn more? You can follow @Arbys over on Twitter and Tweet to them about your favorite Arby's sandwich! They love hearing from their fans! So, let's hear it!!! How many of you have tried the Arby's KING'S HAWAIIAN Roast Beef Sandwiches before? If so, which one is your favorite? What do you love about them? Come on now, speak up, we want to hear from you!